2015 National Home Show was a Success | Envirobond Products Corp. The 2015 National Home Show was a Big Success! Thanks to everyone who stopped by our booth at the 2015 National Home Show in Toronto, Ontario, Canada! We always look forward to seeing familiar faces and making new connections. This year’s booth display was one-of-a-kind and gained a lot of attention. 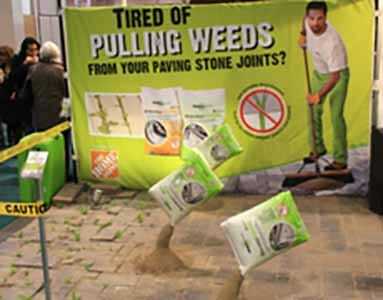 We were excited to see everyone’s reactions to our EnviroSAND bags fighting off weed growth in between paver joints!